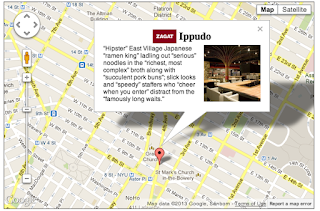 Starting [yesterday], the Google Places API will feature Place Summaries, reliable reviews about points of interest. This allows your application to embed useful review information. For example, car manufacturers can use the API to provide drivers with detailed reviews of local establishments directly in their in-car system. Place Summaries are curated expert reviews and ratings, based on user feedback, that provide information about a location’s key attributes such as decor, quality and service. The API also shows Zagat-recommended establishments. So whether [you are] looking for a local Chinese restaurant or a national park, the Google Places API [can help you] make a quick, informed decision about where to go and what to do.